The Dish is moving! In April, we’ll be joining The Daily Beast. For me, it’s a strange mixture of excitement and sadness. Sadness because the Atlantic has been a very special home for me and all the interns and staffers who have worked at the Dish. The more than four years that I’ve worked here have been the most rewarding, exhilarating and challenging of my career. I cherish my colleagues, their support and debate, and will miss them deeply. But be assured, I’ll continue to link, debate and argue with the team here, and remain immensely grateful to editor James Bennet and chairman David Bradley for their never-faltering faith in what we’ve tried to do. 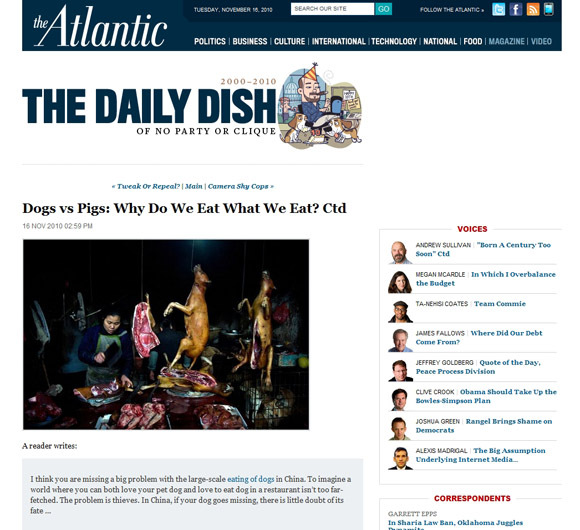 The Dish is almost unrecognizable from what it was four years ago – and that experimentation, growth and creativity were all made possible by the Atlantic. I also have a profound attachment to the magazine’s history and legacy and integrity, which makes leaving hard. But I am very proud to have played a part in the Atlantic’s self-reinvention in this period and its first profitable year in memory. To have played any part in perpetuating this legacy in an environment that has been as tough on magazines as any in memory is an honor I will cherish to the end of my days. But there are some opportunities you just can’t let pass by. The chance to be part of a whole new experiment in online and print journalism, in the Daily Beast and Newsweek adventure, is just too fascinating and exciting a challenge to pass up. And to work with media legends, Barry Diller and Tina Brown, and with the extraordinary businessmen Sidney Harman and Stephen Colvin, is the opportunity of a lifetime. Barry was the person who first introduced me to the Internet in the early 1990s, and we have remained friends ever since. Tina Brown needs no introduction, but to see her in action as we have discussed this new adventure over the past few weeks has been quite a revelation. The Daily Beast, in a mere two years, has made its mark on the web, with 6 million unique visitors last month, and an eight-fold jump in ad revenue over the last year. It will give the Dish a whole new audience and potential for growth and innovation. I’ll also be contributing columns and essays to Newsweek. We remain committed to the same principles from the very beginning: in no-one’s ideological grip, in search of the truth through data and open, honest debate, in love with the new media’s variety and immediacy, committed to accountability and empiricism and resistant to any single category of subject or form. I have no idea where we’ll end up or what the future will bring. But that’s been true for a decade. What I do know is that the Dish is immensely lucky to have this new home, a new challenge, and these new partners. I am thrilled to share the news that Andrew Sullivan is bringing his trailblazing journalism to The Daily Beast. Andrew almost single-handedly defined the political blog and has been refining it as a form of journalism in real time nearly every day for the past decade. When he started his outpost on the Web in 2000, long before political blogging became fashionable, he outdid even his über-productive Fleet Street precursors. Andrew wrote constantly, and obsessively, about everything from politics to his pet beagles. The Daily Dish, as he called it, became the place that took on the big moral questions of the day. Andrew raged (rightly) against the Bush administration’s conduct of the Iraq War and the awful spectacle of torture. Lately, he has taken up arms against Obama’s budget proposal, proving that he plays no favorites. This fearlessness and doggedness makes him a natural soul mate of The Daily Beast. Scrolling down Andrew’s blog helps to give orientation in the world, to get the smartest possible fix on the news at any given moment. A rarity, he is willing to admit mistakes and change positions (sometimes radically) in the face of new evidence. Little wonder he has built one of the most devoted followings on the Web, with 1.2 million unique visitors a month, 82 percent of them bookmarked. I have long thought TDB built an attractive-looking web site, but I have not followed the company per se, nor have I read the new Newsweek, nor do I have a good sense of what Tina Brown on the web might mean. Sullivan was the first blogger I ever read and of course he still is very influential within the blogging field. What do you all think of this move? And is the market for blog acquisitions heating up again? I never begrudge another writer making a living, so congratulations to Mr. Sullivan on movin’ on up to the East Side. Also too I have no beef with about 80% of what he writes about, and am in accord with quite a bit of it. …so long as Mr. Sullivan continues to traffic in the kind of perniciously self-absolving, self-serving revisionist and false-equivalency claptrap that he and so many of his fellow Conservative Expatriates so shamelessly flog in order to hang onto their gigs as Serious Public Persons, I will continue to whang away at the mendacity-based pieces of their infrastructure with a tiny, rubber hammer. Meanwhile, if The Atlantic is looking to fill the newly-created hole in its batting order, perhaps instead of the Usual Suspects, they might consider one of Mr. Sullivan’s fellow Weblog Award winners. Sometimes I just crack myself right up. This is big news because Sullivan is a big name but, really, it’s meaningless to everyone not being paid from the fruits of his labor. While the prestige outlets of the halcyon days of the last millennium still hold some cachet for those of us old enough to remember that era, they mean next to nothing on the Web. Most visitors come in from search engines, social media, and other content aggregators. The URL at which something is hosted is of little consequence, since most readers have little to no awareness of which site they’re on — or even whether it’s a blog or a more traditional outlet. Indeed, Sullivan’s own career is testament to that. From the standpoint of 1990, his career has been in a nosedive: from editor of the storied New Republic to a freelancer bogging on his own domain to blogging for Time, The Atlantic, and now some online startup that didn’t exist when Don Rumsfeld was Secretary of Defense. But, in reality, it has been onward and upward, with his fame, fortune, and influence growing along the way. Indeed, the The Atlantic was mostly an ad network for Sullivan, whose blog accounted for something like a quarter of all their website traffic. The Beast will serve the same function, but I’m guessing they’ll be better at it, since they lack the overhead of a magazine and exist solely as a Web operation. Andrew Sullivan, Trig Truther without peer, goes to the Daily Beast. Among the questions this raises: Who gets custody of all the ghost bloggers?